So you want to be a keeper? Working as an animal keeper can be an extremely rewarding career. Due to a universal love of animals, the animal keeper field is quite competitive. There are actions you can take to help increase your chances of landing one of these life-changing positions. 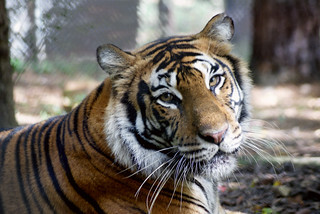 Take a field trip to Carolina Tiger Rescue, or to your local zoo, aquarium, or sanctuary. Spend time outdoors and observe wildlife. Read books and watch TV programs about wildlife, biology, and conservation. Ask for animal-related magazines such as National Geographic Kids, Ranger Rick, or Your Big Backyard. Join clubs or organizations that are biology-related or that spend time outdoors. Volunteer or work in an animal environment (veterinary hospital, local animal shelter, horse stable, local zoo or aquarium). Volunteer at Carolina Tiger Rescue. Plan to attend a college that has a biology or animal-related field of study. Pursue an animal-related degree (i.e. zoology, biology, animal science, wildlife science, etc.). Take animal-related courses (i.e. physiology, animal behavior, ecology, zoology, population dynamics, animal husbandry, etc.). Volunteer and participate in internships. This is a great way to gain experience with a variety of species. You may find you enjoy a different area of animal care than you expected. Contact HR of any animal facilities in your area for possible job openings. If you can’t get a job immediately in your desired field, consider volunteering to gain experience. If you are interested in furthering your education, consider graduate school for a Master’s degree (however, most facilities only require a Bachelor’s degree). Do it because you love the job! Animal Keepers are generally paid a minimum wage. Be physically fit and have a good attitude. You will be working outdoors and in all weather conditions. Contrary to what many people think, keepers spend a lot of time interacting with the public. If you want to work with animals to avoid working with people, don’t be deceived. Animal keepers give educational presentations to the public, guide tours, and interact with people on a daily basis. Be prepared to work flexible hours and days. This is not a 9-5 job. You have to work holidays, weekends, and sometimes after your shift was supposed to end. Animals need care every day. Most animal facilities require a college degree. The best way to know if you will enjoy being a keeper is to experience it by volunteering or interning at various zoos, aquariums, rehabilitation centers, or sanctuaries. Don’t get frustrated. It takes time to gain the experience you need to be successful in the animal care field.